256 pages | 13 B/W Illus. This book is an appreciation of the long and illustrious career of Milton Lodge. Having begun his academic life as a Kremlinologist in the 1960s, Milton Lodge radically shifted gears to become one of the most influential scholars of the past half century working at the intersection of psychology and political science. In borrowing and refashioning concepts from cognitive psychology, social cognition and neuroscience, his work has led to wholesale transformations in the way political scientists understand the mass political mind, as well as the nature and quality of democratic citizenship. In this collection, Lodge’s collaborators and colleagues describe how his work has influenced their own careers, and how his insights have been synthesized into the bloodstream of contemporary political psychology. The volume includes personal reflections from Lodge’s longstanding collaborators as well as original research papers from leading figures in political psychology who have drawn inspiration from the Lodgean oeuvre. 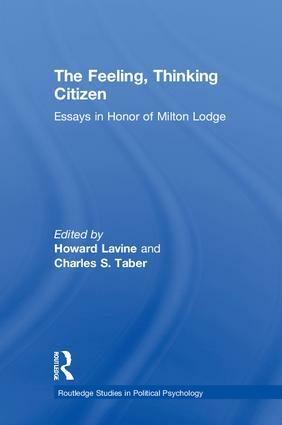 Reflecting on his multi-facetted contribution to the study of political psychology, The Feeling, Thinking Citizen illustrates the centrality of Lodge’s work in constructing a psychologically plausible model of the democratic citizen. Howard Lavine is Arleen C. Carlson Professor of Political Science and Psychology at the University of Minnesota and Director of the Center for the Study of Political Psychology. He is author of Open versus Closed: Personality, Identity and the Politics of Redistribution (2017) and The Ambivalent Partisan: How Critical Loyalty Promotes Democracy (2012), which won the Robert E. Lane and David O. Sears Book Awards. He is editor of Advances in Political Psychology. Charles S. Taber is Professor of Political Science and Dean of the Graduate School at Stony Brook University. He received his PhD from the University of Illinois, Urbana-Champaign in 1991, and works in the fields of political psychology and computational modeling. Taber has contributed to the growing literature on the psychological mechanisms that drive public opinion, and his 2013 book, The Rationalizing Voter, coauthored with Milton Lodge, won the Robert E. Lane Book Award and the Book of the Year Awards from the Experimental Politics and Migration and Citizenship Sections of the American Political Science Association. Political psychology is dedicated to the analysis of the interrelationships between psychological and political processes. The field is interdisciplinary in nature, bidirectional in influence (the psyche influences political orientation and the polity leaves its mark on who we are), and draws on a broad range of disciplinary sources, including cultural anthropology, history, economics, neuroscience, behavioral genetics, sociology, and organizational behavior. From a psychological perspective, politics is not only about "who gets what" in the material sense; it is also about how psychological predispositions, social identities and bounded information processing capacities fundamentally shape and constrain how individuals interact with their government and society at large. The Routledge Studies in Political Psychology was developed to publish books representing the widest range of theoretical, methodological and epistemological approaches in political psychology. The series is intended to expand awareness of the creative application of psychological theory within the domain of politics and foster deeper appreciation of the psychological roots of political behavior. We are particularly interested in scholarly monographs, but proposals for edited volumes will also be considered.